While we are delighted that CityEast Markets will help eliminate “Food Deserts” and will be a rare Black owned supermarket, long before we became aware of the “Food Desert” Syndrome or the rarity of Black owned supermarkets our primary purpose for opening CityEast Markets was and still is job creation from the $127,471,835.03 residents of our targeted East Oakland community at 55th Avenue east to San Leandro spend annually in supermarkets; somewhere. Research shows that some 739 jobs are potentially created from this $127,471,835.03 but few in our targeted community due to the absence of supermarkets. Our supermarket CityEast Markets is fully researched and well planned. The total cost to open CityEast Markets is $7,948,475.00. We are pre-qualified for a 5 million dollar SBA loan that will cover 57% of the cost and we are authorized to sell 300,000 shares of preferred stock in our supermarket to raise the remaining 3 million dollars. In terms of expansion we plan to franchise through athlete ownership to expand our number of stores to another 5 to 7. This expansion plan will only work when the CityEast Markets brand is established. An attorney estimates that this branding could happen in two years or less. Branding is important to athletes who may invest in CityEast Markets due to the many bad investments athletes have made in start-up businesses. CityEast Markets will likely be on the fourth Black owned full service grocery store (supermarket) in all of the U. S. as a June 2013 PBS presentation of a study by Kellogg School of Business revealed that there are only 3 Black owned full service grocery stores (supermarkets) in all of the U.S. This; in spite of the estimated over 34 million dollars that Black household spend on grocery nationwide annually. This means that our supermarket will likely be only the fourth Black owned supermarket in the U.S. and as such will make national news and generate very positive publicity for Oakland and raise the hopes and dreams of the largely Black population in our targeted East Oakland community. There is a real need for a Black owned supermarket in Oakland. CityEast Markets will bring hope and pride and instill much needed “possibility thinking” among the Oakland’s largely Black population. CityEast Markets supermarket is a wholly owned subsidiary of our Oakland based 501 (C) (3) non-profit; The Kinte Center for the Study of Urban Commerce, Inc., which has a Specific Purpose to reduce unemployment in East Oakland. It is our philosophy that many of the problems and much of the errant behavior among some of the residents in our targeted East Oakland community at 55th Avenue east to the Oakland-San Leandro border is due to conditions of hopelessness and despair brought on by a perpetual inability of affected residents to provide for the basics i.e., food, shelter and clothing for themselves and family. This condition can be overcome only through employment. Research shows that thousands of jobs are created from the over 34 billion dollars that residents of our targeted largely Black East Oakland community spend annually on goods and services; if only there were community serving retail businesses in the community where residents could spend these dollars. We advocate for community based major, job creating retail businesses in our targeted East Oakland community. This advocacy is further materialized in a concept we call the Oakland Urban Model at www.kintecenter.org. CityEast Markets supermarket grew out of the "Grocery Stores" component of this model. The parent company of CityEast Markets; the (C) (3) non-profit, The Kinte Center for the Study of Urban Commerce, Inc. has uniquely studied the annual household “Grocery Consumer Buying Power” of the residents of our targeted largely Black low income East Oakland community which is $127,471,835.03 (Over 127 million dollars) and in line with the non-profit’s specific purpose, determined that some 739 jobs are potentially created from these dollars; Unfortunately most of these jobs are created due to a shortage of supermarkets in the community. It is critical that these dollars are spent in our targeted low income East Oakland community to provide jobs and economic opportunity which will provide a means for those in the community to acquire the basics i.e., food, shelter and clothing which will in turn reduce the levels of hopelessness and despair and resulting errant behavior on the part of an inordinate number of persons in the community. CityEast Markets Team has more than 50 years of collective supermarket management experience, as well as education and experience in business, banking, medicine, start-ups, and architecture along with small business ownership and management experience, among others. President and CEO C. Edward “Ed” Brown, a retired disable veteran, had a long career in banking and finance management with the Bank of America, managing staffs of 50 or more employees in financial data processing and accounting functions. He has also owned two small businesses and developed and launched a produce market in North Oakland. Mr. Brown volunteered with the City of Oakland for more than five years and was twice elected the Chairman of Community Policing with Letters of Compliment. CityEast Markets is a “Labor Love” in that there will be no remuneration for the founder, board members or volunteers etc. The preference is that profits from CityEast Markets store operations go to fund the Parent Company; the 501 (C) (3) non-profit The Kinte Center for the study of Urban Commerce Inc.’s Youth Employment Program at www.kintecenter.org (Click on the Youth Employment plaque in the left side bar). 1). CityEast Markets will help eliminate a “Food Desert” situation in a community that is saturated with fast food outlets and has a food related hospitalization rate for food related illnesses such as obesity, diabetes and heart failure that is three times the countywide rate. A “Food Desert” exists where residents have to travel a mile or more to purchase healthy food. Currently the residents of our targeted East Oakland community travel on average 3.1 miles to a supermarket. CityEast Markets at 8930 MacArthur Blvd. will reduce this distance from the average of 3.1 to an average of 1.6 miles. 2). CityEast Markets will likely be only the fourth Black owned supermarket in all of the U. S. and as such it will instill a sense of pride and raise the self-esteem of Oakland’s largely Black population. It will also cast Oakland in a positive light nationally. 3). CityEast Markets' initial store will create some 40+ new jobs in our targeted low income East Oakland community with plans for additional stores through franchising that will create even more jobs. NOTE: Our initial and overwhelming motivation for opening CityEast Markets is for the jobs it will create in our largely Black low income East Oakland community as this is in line with our parent company‘s i.e., non-profit’s specific purpose which is to reduce unemployment in East Oakland. Research shows that our targeted largely Black low income East Oakland community at 55th Avenue east to the Oakland-San Leandro border has a population of 106,000. This population can support 11.2 supermarkets. This 11.2 supermarkets would enable the residents of the community to spend the $127,471,835.03 (Over 127 million dollars) that the residents of the community spend annually in supermarkets in our targeted East Oakland community to actually create the 739 jobs that are potentially created from this over 127 million dollars in the targeted community. Currently there are only three (3) supermarkets serving our targeted East Oakland community which means that some 73% or roughly 541 of the 739 jobs potentially created from the targeted community's annual consumer expenditures on grocery are created in other communities. It is our objective to change this with starting with a first CityEAst Markets and future franchises thereof. The graphic below depicts the total of $127,471,835.03 (Over 127 million dollars) that residents of our targeted East Oakland community currently spent in grocery stores somewhere along with the potential number of jobs created from these dollars (See blue bar). 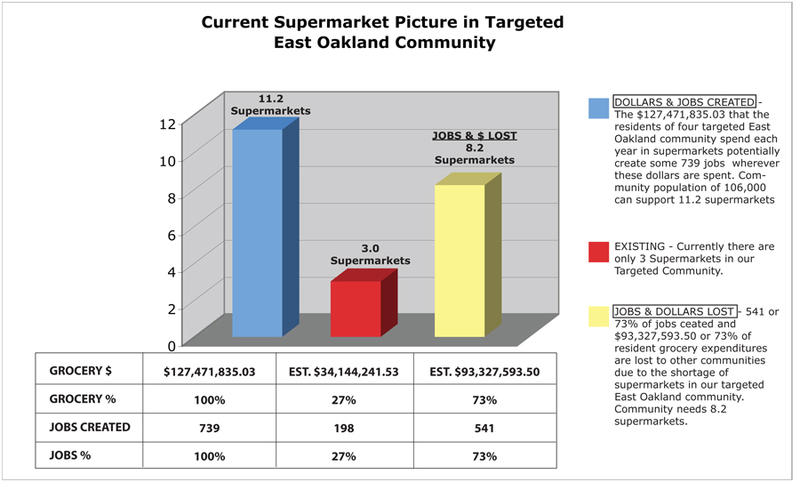 Next the red bar shows that only $34,144,241.53 or 27% of the $127,471,835.03 (Over 127 million dollars) is spent in grocery stores in our targeted East Oakland community and that only 198 or 27% of the potential 739 jobs created from resident grocery expenditures are created in our targeted East Oakland community. Finally the third bar (yellow) shows that $93,327,593.50 or 73% of resident total expenditures on grocery is spent in grocery stores in other communities. Thusly some potential 541 jobs are lost to other communities where this $93,327,593.50 is spent. Considering the high unemployment rate in our targeted low income East Oakland community the community can ill afford to lose 541 or 73% of the jobs created from it's resident grocery consumer expenditures in grocery stores to other communities. (See Graphic below): Our supermarket will lead the way to changes this. Currently there are only three (3) supermarkets serving our targeted East Oakland community which means that some 82% or roughly 606 of the 739 jobs potentially created from the targeted community’s annual consumer expenditures on grocery are created in other communities. It is our objective to change this with CityEast Markets and its franchises to follow. All too often we hear comments to the effect "That they already have supermarkets in East Oakland"; referring to the three that are currently there. These comments come from those who have not studied the community’s annual consumer expenditures on grocery buying power of an estimated $127,471,835.03 (Over 127 million dollars) in annual consumer grocery expenditures from a job creation perspective. If so they would see that potential community jobs are lost due to the absence of a sufficient number i.e., a full 11.2 supermarkets. Further, for the record, with respect to the observation that they have supermarkets in East Oakland, the Bar Graph below shows the average number of supermarkets per person in the U.S, the supermarkets per person in Oakland’s more affluent combined communities of Piedmont Avenue, Rockridge and Montclair VS our targeted East Oakland community. All too often we hear comments to the effect "That they already have supermarkets in East Oakland"; referring to the three that are currently there. These comments come from those who have not studied the community’s annual resident consumer expenditures in grocery stores that total an estimated $127,471,835.03 (Over 127 million dollars) and a population that can support 11.2 supermarkets that would potentially create some 739 jobs. 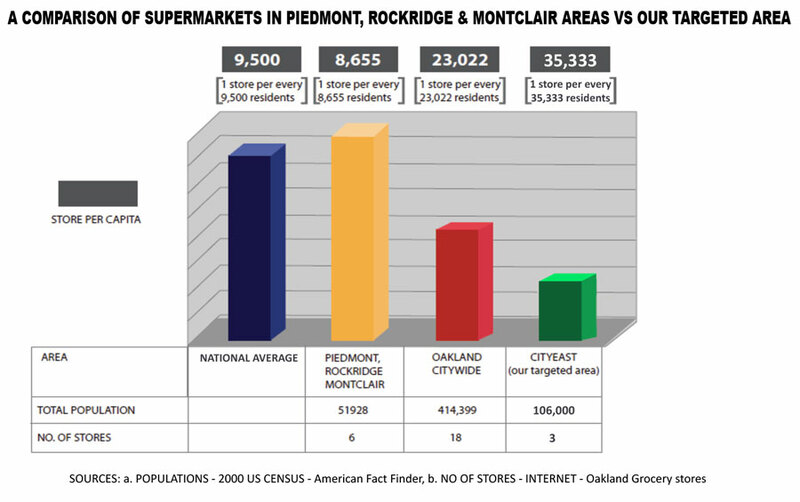 As a comparison, the graph below shows the average number of supermarkets per person in the U.S, the supermarkets per person in Oakland’s more affluent combined communities of Piedmont Avenue, Rockridge and Montclair VS our targeted East Oakland community. In the more affluent combined communities of Piedmont Avenue, Rockridge and Montclair, there is one supermarket for every 8,555 community resident where as there is only one supermarket for every 35,333 residents in our targeted low income East Oakland community. This disparity costs our targeted community jobs and wealth. NOTE: Success of the planned CityEast Markets will move our largely Black low income community at 55th Avenue east to the Oakland-San Leandro border toward an Economic-Job Creation footing. The disparity shown in the graphic above between supermarkets per person for Oakland’s more affluent community’s vs our targeted low income East Oakland community means that roughly 82.2% of the jobs potentially created from our targeted East Oakland community’s annual consumer expenditures on grocery are spent and create jobs in other communities. Wheel Chair ready van service for senior citizens and disabled Veterans to and from the store. CityEast Markets is exploring implementing a system whereby shoppers, using their store membership card can purchase groceries on credit during the last seven days of each month, if no previous balance.